Check out this fabulous tutorial to make a 12″ finished Gretchen block. The Gretchen block is traditionally made up of only 2 colours. This tutorial uses a series of light and darks with red and white prints for the pinwheel of each block. Great for using up scraps. I love that! What a great scrap block. Thanks for the tutorial. I love this block! The fabrics really suit the pattern too. Thanks for sharing! 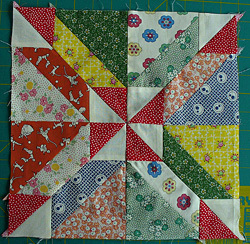 What a great block – thanks for the tutorial! The design is excellent. The fabrics and patterns a good combination.